Berliner weisse is a rare thing: a sour beer, intensely flavored and the embodiment of refreshment. Its tartness is generally mild; its carbonation high; its soft, wheaty flavor refreshing. Even Napoleon was a fan — a popular story says he dubbed the beer style “the Champagne of the North” while occupying the German capital in 1809. As you might expect, the style is said to have originated in Berlin near the end of the 16th century and was at one time the most popular beverage in the city. Three aspects set it apart from other beers: It’s brewed with wheat, is crafted to be low in alcohol (traditional versions are around 3 percent to 4 percent ABV) and is slightly sour (a flavor many Germans counteract through the addition of flavored fruit syrups.) 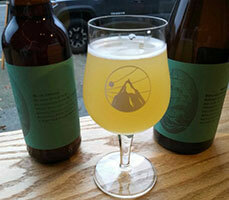 Interested in tasting some Berliner weisse? 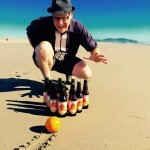 We offer five in our beer flight Craft Beer Crosscut 4.6.19: A Flight of Berliner Weisse. James Alexander and Ryan Miller took time away from their East Coast brewery jobs to hang in a remote cabin nestled in the Green Mountain National Forest. When they emerged Structures Brewing idea was a thing. They slowly made their way toward Bellingham through various brewery jobs across the country. Bellingham fit their easy-going lifestyle and need for community. In late 2015, Structures had structure and several beers on tap. Structures puts puncheons to good use, including their Devoid Berliner weisse, fermented and aged in white wine puncheons for 4 months. Named for a mystical island of adorable virtual pets, and blurring the lines between a sour ale and a Berliner weisse, Modern Times Beer‘s Lutari is a refreshingly tart fruit bomb. Built on a light malt base, the inclusion of fresh mangos, guavas, and apricots give this beer plenty of fruit flavors and makes it one of the most crushable sours on the market. The only thing we like better than a traditional Berliner weisse — a mildly sour German wheat beer named for the city where it was born — is a traditional Berliner weisse with a little blackberry syrup. 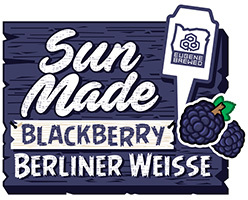 Oakshire Brewing‘s Sun Made is a Berliner that requires no syrup to get that extra layer of flavor. Inspired by 10 Barrel’s Crush series, the Eugene brewery adds bushel after bushel of Oregon blackberries to this softly tart 4.1 percent ABV sour wheat beer. Pouring a deep amber-red with a thin white head, Sun Made Blackberry begins with wheat malt and tart blackberry flavors, then finishes dry with tart blackberry and some salty flavors. Sometimes Berliner weisses are brewed with fruit at later stages or fruit syrup is added to the basic beer after filling a glass at the tap. Beets are high in sugar, but adding beets to beer leaves no sweetness after a week of fermentation. Instead, the beer is dry with an earthy taste. The North Fork Brewery combined the two ideals in their Golden Beet Berliner Weisse brewed with Skagit Valley pilsner and red wheat malt, German Tettnang hops and juiced organic golden beets for a tart yet balanced beer with low alcohol and a touch of earthiness. Berliner weisse is a rare thing: a sour beer, intensely flavored and the embodiment of refreshment. Its tartness is generally mild. Its carbonation is high. It’s refreshing with soft, wheaty flavor. 10 Barrel R&D brewer Tonya Cornett brewed her cucumber Berliner weisse for the 2013 Portland Fruit Beer Fest. It went on to win a gold medal at the 2014 and 2015 World Beer Cup. Then, she crushed raspberries. Acidulated white wheat, raspberries and an inoculation of Lactobacillus in the fermenter give this sour ale its tart, fruity taste. Low hop levels let the special sour flavors dominate, and rice syrup helps yield a particularly light finish and body.